With a slew of great games to choose from, this week we’re going with a theme for the recap. Three teams asserted power with their wins this weekend and made it clear that we should be paying serious attention to them (in case we weren’t already). 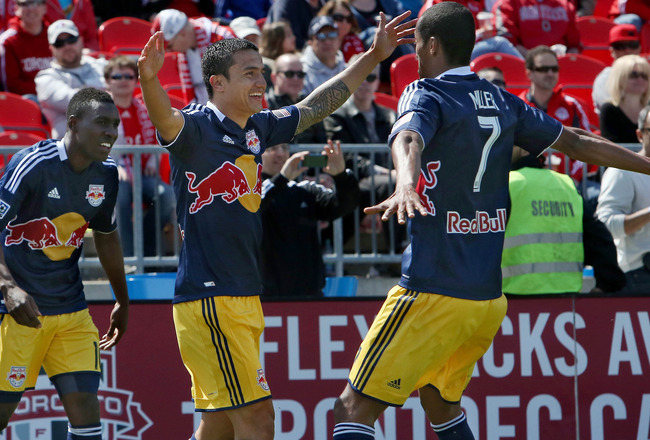 Against the Red Bulls, Toronto gave up yet another late goal, which this time meant a loss instead of a draw. It took until the 38th minute for either side to find a goal, but Tim Cahill’s opener came off a Roy Miller cross that Thierry Henry dummied perfectly, allowing Cahill the easy finish. Toronto got the equalizer in the 83rd minute when Red Bulls keeper Luis Robles was caught out of his net after a Toronto free kick; Jonathan Osorio capitalized off the mistake with a sweet finish from just outside the box to tie things up. However, New York snatched their three points in the 89th minute as Cahill headed in an Henry cross. For Toronto, the late goal was another punch to the gut for a team that is now winless in their last six games. For New York, the win was important for a team that has big aspirations but has struggled in the past to find a rhythm. 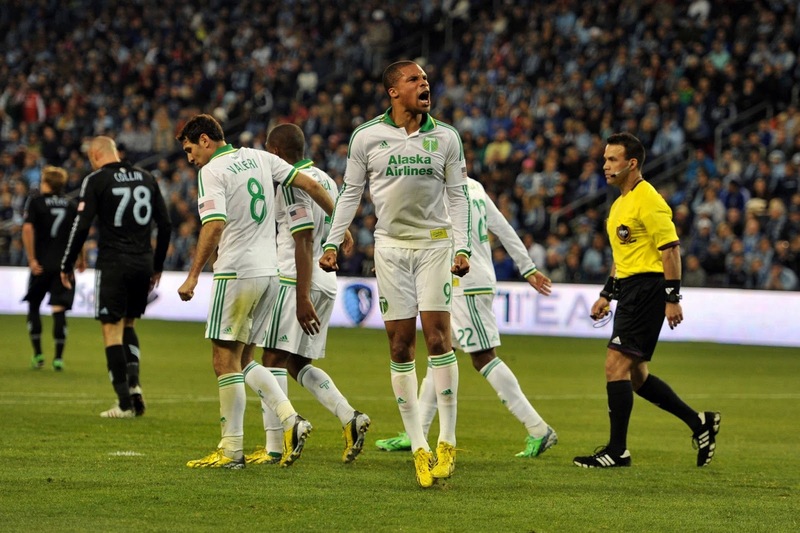 The Timbers made a big statement with their come-from-behind away win over Sporting Kansas City. Chance Myers got SKC off to a dream start with a goal in the first minute, but Portland answered with an equalizer from Ryan Johnson in the 24th. Minutes later, though, Myers bagged a brace, giving SKC the lead again with a tap-in goal. 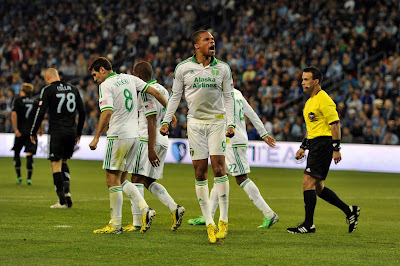 The Timbers wasted little time in finding another equalizer through Darlington Nagbe, and the match remained locked at 2-2 until the 58th minute. That was when Diego Chara slid a ball through to Rodney Wallace, who in turn slipped a goal past Jimmy Nielsen. The game featured plenty of back-and-forth play, and SKC pushed for another goal, but ultimately the Timbers came out of Sporting Park with a huge three points. Missing Robbie Keane, Landon Donovan, Todd Dunivant, and Carlo Cudicini, the LA Galaxy still managed to grab a 2-0 win over Real Salt Lake at the Rio Tinto. Mike Magee nodded home his sixth goal of the season in the sixth minute thanks to free kick service from Juninho. Then, in the 13th minute, rookie Charlie Rugg fired in a goal from close-range after a ball from Hector Jiménez found him in the box. RSL struggled to break down the Galaxy defense though they enjoyed the majority of possession; LA keeper Brian Rowe, making his professional debut, proved up to the task of saving RSL’s efforts. Like the Red Bulls and Timbers, the Galaxy sent a message of intent this weekend. It’s worth mentioning some of the weekend’s other results, particularly since they involved plenty of goals. Vancouver and Dallas battled out a 2-2 draw at BC Place, while the Columbus Crew handily beat DC United 3-0, and the Quakes invoked Goonie magic to salvage a late 2-2 draw away to Chivas. Plus, the New England Revolution got an important 2-0 win over the Philadelphia Union. The season so far hasn’t been especially heavy on goals, but this weekend certainly was. Columbus’ game against DC featured some unexpected pyrotechnics as Crew Stadium’s scoreboard caught fire before the start of the match. The fire department put out the fire and supporters were moved to other sections of the stands. The Revs travel to Portland for a tough test against the Timbers, while New York head to a hopefully fire-free Columbus. The Union host the Sounders and the Quakes host the Impact as Toronto visit Colorado. Meanwhile, Real Salt Lake and Vancouver will duke it out at Rio Tinto, Kansas City welcome Chivas, and the Dynamo face the Galaxy at the HDC. Tim Cahill. His brace got New York the win, and the DP was due for a goal (his last was in August 2012). He’s making the big bucks to be a game-changer, and against Toronto he certainly was.